In Beijing, Even Luxury Billboards Are Censored In China, certain words have long been politically sensitive — for example, "Tiananmen Square," or "democracy." But the list is growing longer. Words like "regal" and "luxury" are being removed from billboards in Beijing. 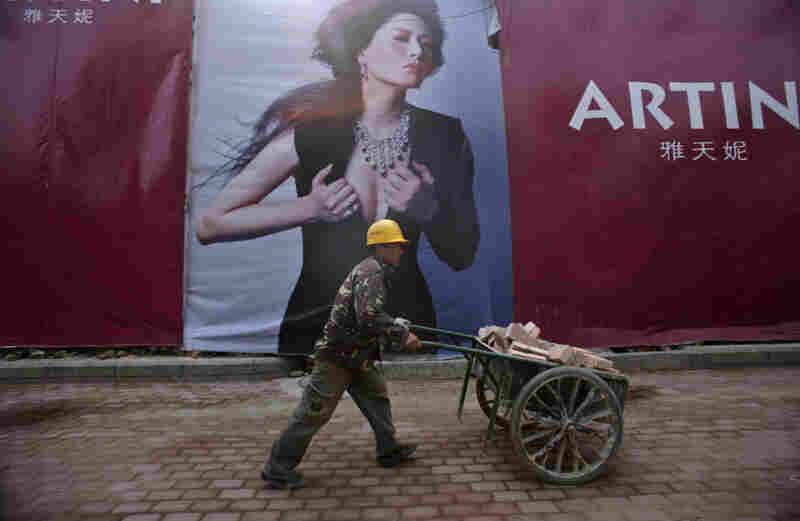 Beijing has moved toward restricting the use of certain words associated with luxury in its billboard ads. In China, certain words — like "Tiananmen Square" and "democracy" — have been politically sensitive for decades. But that list seems to be growing ever longer. Now, words like "regal" and "luxury" have fallen foul of political correctness, and are being removed from billboards in the Chinese capital, Beijing. But Beijing's attitude toward luxury is somewhat contradictory — only the ads, not the products themselves, are being restricted. On a busy road in a Beijing suburb, a billboard promotes a new property development whose name translates literally as "the impression of a royal castle." The picture shows a woman in a flowing red satin dress standing in front of the Arc de Triomphe in Paris. It's laughable, perhaps — but the billboard will soon be forbidden in China's capital. The city's new rules state that ads must not glorify "hedonism, feudal emperors, heavenly imperial nobility" or anything vulgar, according to the Global Times newspaper. They also should not violate "spiritual construction" standards or worship foreign products — leading some to believe the campaign could be targeting foreign luxury goods. "The truth is that the party has very clearly started what is very clearly a campaign against ostentation in China," says David Wolf of Wolf Group Asia, a communications advisory agency. "There is a pushback against things Western. And there is the desire to see those Western things take a lesser role in the development of Chinese culture." The Global Times reports that words such as "supreme," "royal," "luxury" and "high class" were originally forbidden as part of a cleanup campaign before the Beijing Olympics. But in recent years, they've crept back onto billboards again. China Daily reports that the campaign is aimed at protecting social harmony, quoting a sociologist who says advertisements that promote the belief that "wealth is dignity" could upset low-income residents. But at the same time, China's new rich still have money to burn, and the country is second only to Japan as a consumer of luxury goods. The luxury splurge is driven by people like 20-something Li He, who recently stood outside an upscale shopping mall with three friends, clutching a stiff brown Gucci shopping bag. He had just spent $450 on a leather belt. When asked if banning certain words will change his shopping habits, Li He scoffs. "Those who should be rich are rich, those who should be poor are poor," he says. "Those who work hard get rich, while those who don't stay poor." When asked what he works hard at, he replies, "I work hard at having fun." The leather belt, he admits, was bought with his parents' money. That sticks in the craw of a construction worker who gave his name as Mr. Tang, who says he would need to spend more than a month's wages to buy a single Gucci belt. "I feel uncomfortable seeing people waste money like that," he says. Still, it's not as if Tang and his fellow workers will be burning Burberry billboards anytime soon. In fact, he says that he sees the new regulations as slightly ridiculous. Peking University sociologist Zheng Yefu also doubts the new rules will make any difference, given the images lionizing wealth and luxury that abound in China's media. "Our TV shows are full of shots of rich people's extremely luxurious lifestyles — their houses, their dinners, their clothes, everything," Zheng says. "But nobody is interfering with that. So will banning certain words from billboards really have any benefits?" Despite the assault on billboards, Beijing's not taking aim at luxury goods in general. On the contrary, it's considering cutting its high taxes on luxury goods, to encourage wealthy shoppers to stock up on their Louis Vuitton at home, rather than overseas. And China is starting to open up its low-altitude airspace under 4,000 meters (13,123 feet) to private planes, in a move that will create a new market in private aircraft for the super-rich. Some analysts also point out that limiting the ability of foreign luxury brands to market their goods in Beijing could level the playing field, helping China's aspirations to foster its own luxury brands. So, Beijing may be using foreign luxury goods to send a political message — but it still wants to cash in on them.